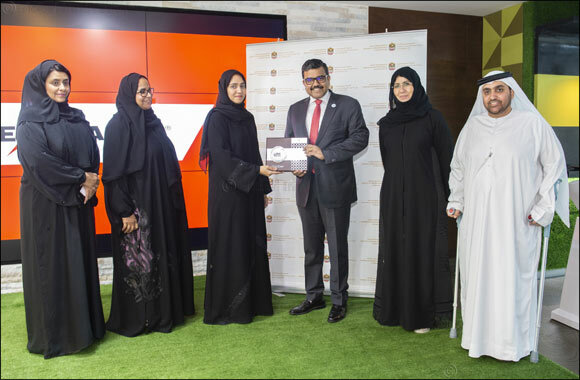 Abu Dhabi, 15 Oct 2018: Her Excellency Farida Abdullah Al Ali, Assistant Undersecretary, Ministry of Human Resources and Emiratisation (MOHRE), bestowed the Tawteen Club Trophy to UAE Exchange, a leading global remittance, foreign exchange and payment solutions brand in the UAE. With this trophy, UAE Exchange has entered the most prestigious class of the club - the Platinum Class. Over the years, UAE Exchange has actively worked towards the goal of skill development among the Emirati community and received many accolades for it. Some of them include the Emiratisation Award by UAE Minister of Economy (2016), Mohammed Bin Rashid Al Maktoum Business Award (2017), UAE SDG Pioneers Awards (2017) etc. In 2017, UAE Exchange was also honoured by the Ministry of Human Resources and Emiratisation for its Emiratisation efforts and by the Department of Economic Development (DED) for having dedicated Arabic counters – Hayakoum – across the emirates. UAE Exchange has also been named as one of the top ‘Great Place to Work’ companies in the UAE two years in a row. The Tawteen Partners Club offers special privileges, incentives, and services to MOHRE-registered organisations based on their classifications such as Silver, Gold and Platinum.